112 members attended the workshop with Gordon Lafer on March 23. For the last 40 years, the House of Labor has been under assault by powerful, moneyed forces that would like nothing more than to see unions become a thing of the past. From union-busting campaigns, to so-called “Right to Work” policies, to efforts to weaken and de-fund unions through court cases such as Janus vs AFSCME, there’s no question that our opponents have a wealth of anti-union knowledge and tactics at their disposal – and they’ve been exercising this knowledge and power, to the detriment of working people across the nation. 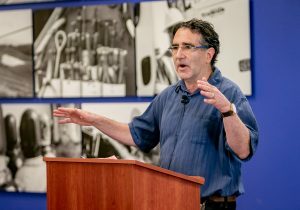 But the good news is that the Labor Movement is building power through knowledge as well, thanks to a growing cohort of pro-worker academics and thought leaders, including longtime IBEW friend and ally, Professor Gordon Lafer. A political economist, researcher, author and well-known lecturer at the University of Oregon, Lafer offers working-class advocates the opportunity to understand exactly how and why anti-union forces are undercutting workers at every turn – and what we can do to effectively fight back on behalf of all of the working families who have been negatively impacted by these corporate-backed attacks. In what has become an annual tradition, Lafer returned to Weakley Hall on March 23 for his third annual workshop just for IBEW 1245 members. 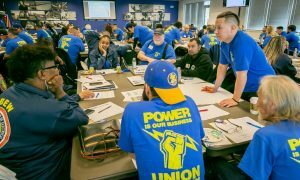 A dynamic group on 112 members — including many of who had never participated in any sort of union organizing activity before — volunteered to spend their Saturday at the day-long workshop. The extraordinary turnout was a product of methodical outreach and follow-up conducted by lead organizing stewards, with support from IBEW 1245 business reps and staff organizers. The fact that so many dedicated their day off to come to the hall is indicative of the growing interest in and commitment to keeping the union strong in a time of unprecedented challenges on all sides. Business Manager Tom Dalzell answered questions from members. 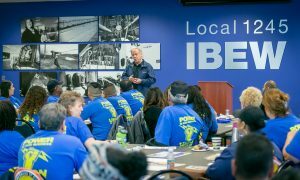 IBEW 1245 Business Manager Tom Dalzell kicked off the day by acknowledging the commitment and dedication of the members who have invested their time and energy into making 1245 one of the strongest and most powerful local unions in the nation. He described the monumental impact that Local 1245’s member-driven organizing program has had in effecting politics and policies that impact workers in both California and Nevada, articulating the many wins we’ve racked up thanks to this growing wave of activism. He spent some time answering questions from the members, including a number of questions regarding the PG&E bankruptcy, all the while underscoring the value of worker-led collective action – not just at PG&E, but at all utility-related employers that stand to be impacted by the current and future political landscape. IBEW 1245 Staff Organizer Fred Ross Jr proceeded to introduce Professor Lafer, who offered three eye-opening presentations to the group. The first session focused on the attacks on labor in the public sector, including an overview of anti-union “Right to Work” laws and the recent Janus vs AFSCME Supreme Court case. Lafer then moved into an overview of the power players and architects behind the corporate assault on American workers, linking together the public sector fights with those occurring in the private sector. Finally, Lafer evaluated some of the Labor Movement’s most successful counter-offensives, including 1245’s own highly effective organizing program, which is largely recognized as one of the most ground-breaking and transformative programs in the nation. After each presentation, the members in attendance broke into groups and discussed how they could use the information that Lafer presented to build union strength. They examined some of the common questions and anti-union rhetoric they encounter in their everyday lives, and imagined how they might apply some of their newfound knowledge to such conversations, approaching each interaction as an opportunity to inform and engage their fellow workers. For six-year IBEW member Zavi Heiland, a system operator at PG&E’s Grid Control Center in Vacaville, the workshop re-ignited a passion for labor history and union organizing that has been burning inside her ever since she was a teenager. Heiland has been ardent about effecting change for her entire adult life, and the information that Lafer presented resonated with her on a profound level. “The knowledge that I gained today … I feel like I can share that with the other people that I work with. I want to let the people in the Grid Control Center know about the level of organizing that the union is involved in,” she added. 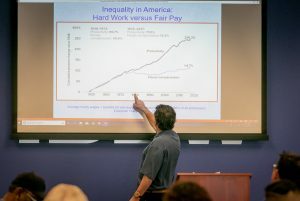 While Heiland came to the workshop with a substantial base of knowledge about Labor’s role as defenders of the middle class, many of her fellow members in attendance were hearing much of this information for the first time. 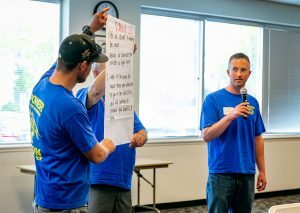 A fourth-generation IBEW member, PG&E Lineman Daniel Morrison was relatively unaware of the full extent of the concerted attacks on working families before attending the workshop. He found Lafer’s presentation incredibly eye-opening and intends to make good use of the information. PG&E Gas Service Rep Phil Wiltens also found the information that Lafer offered to be highly utilitarian. He was particularly struck by how anti-union forces have effectively divided the working class, something he recalls from his own upbringing. For Lead Organizing Steward Brittney Santana, who works as a first field clerk for PG&E in Fresno, this wasn’t the first time she’d heard all of this information, but she still found the experience to be highly motivating. 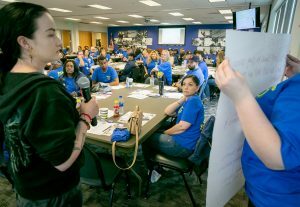 “I think it’s important to take the information back to our work groups and be as informative as possible, try to mobilize them, get them involved, get them to our unit meetings or a training like this one … so we have the opportunity to get the ‘organizing bug’ in them, like we have it in ourselves,” she said.